I am not surprised at all with this letter. My suspicions have now been justified. Veday lechakimoh beremizoh! You are placing words in R’Rabi’s mouth. I have not seen any claim on his website that LBD approves of his kashrut. 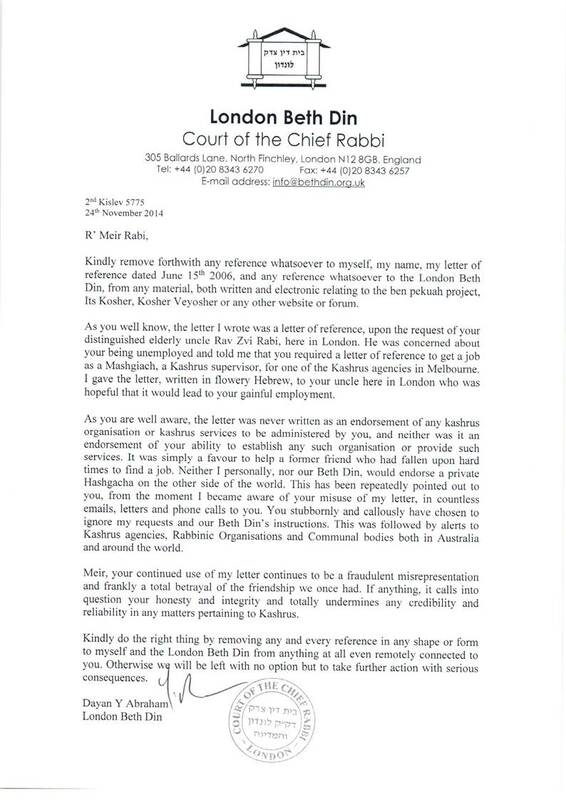 The letter printed on the website is that R’Rabi is known by Dayan Abrahams and that the later has a certain level of respect for R’Rabi. Nothing about approving a kosher authority. If I am incorrect please point me to the page where it is claimed that LBD approved Kosher V’Yosher. At the moment it would seem that the LBD have made a statement about a claim R’Rabi never made. Yaron – people can understandably assume that the approbation on RR’s website refers to RR’s kashrus. After all, the site is not RR’s personal site but that of his kashrus business. In addition, the letter specifically states that all of RR’s decisions are those of a Talmid Chacham – the inference being (to those who link this letter to RR’s kashrus business) that RR’s kashrus is somehow approved by the LBD.. 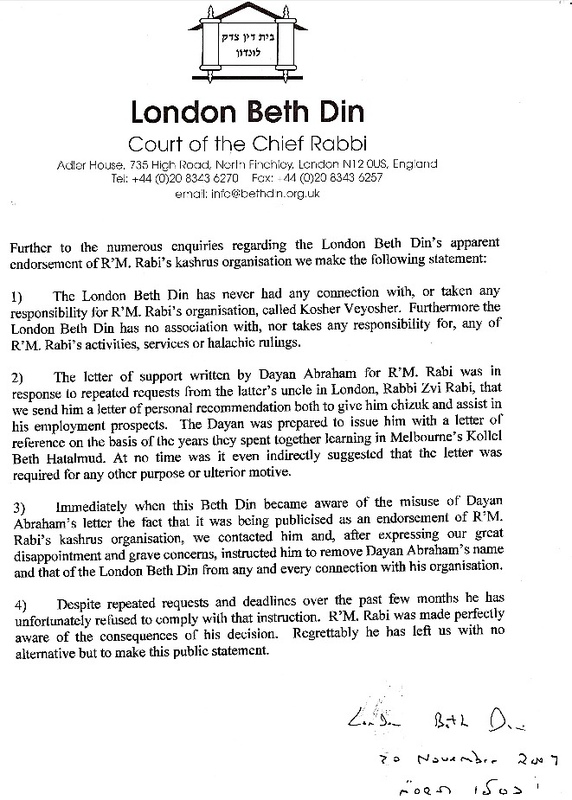 Regardless, if Dayan Abraham has asked RR to take the letter down – regardless of the reasons – then RR has a chiyuv to do so. Here you go putting meaning where it does not really exist. So why do you try to find hidden meanings in the letter? It is also clear that the reason for this letter from LBD are the “numerous inquiries”. It is either worried consumers or people looking for a way to destroy R’Rabi who have triggered this letter by repeatedly going to LBD. My money is on the later. The numerous letters were obviously written by people (including myself) who understood from his website that Rabi is backed by LBD with a very distinguished letter on his website enhancing his stance, while ALL the other Rabbanim in Melourne have come out against him. The answer for many was to get it straight from the horses mouth – LBD never heard of Rabi and were distressed that many people were confused by this letter and its relation to Kashrut. To resolve the situation they asked for the letter to be removed from the website. Dayan Abrahams and others at the LBD have seen the ‘it’s Kosher’ website and have asked that the approbation from Dayan Abrahams on said website be removed. They have obviously made a decision that it breaches how they would like their comments to be presented and viewed by the public. Note: They haven’t retracted what they wrote, they just want a little respect and courtesy in how it is presented to the community at large. I think you will find that the longer the letter stays up on the website the more damage it will do to Rabis credibility. Not so much as to his ability to learn Torah or make Halachik decisions but in terms of his Midot and this is a key definer of someones ability to be trusted with making Torah decisions. Next Next post: Neutered correctness gone mad?